George Morrison’s Tableau – A Native American Mosaic is being installed between 11th and 12th Streets. The handsome paving carpet, one of the historic works returning to the mall, will provide a gracious transition between Nicollet and the Loring Greenway. 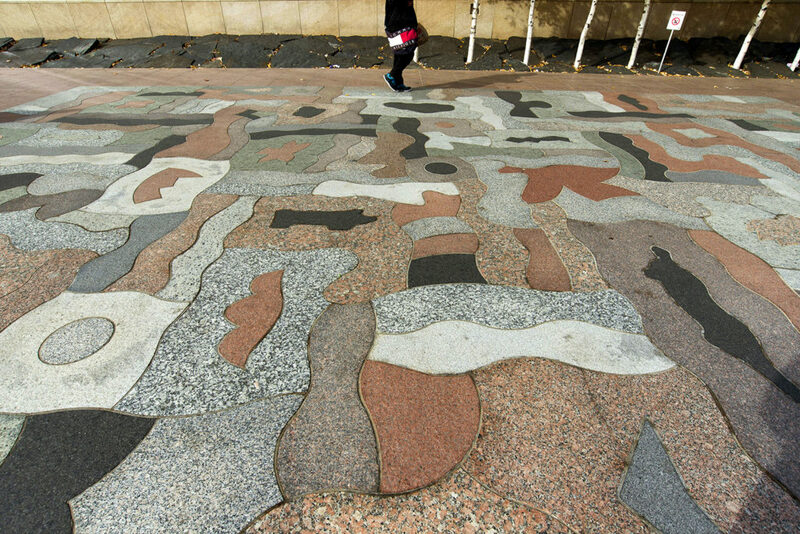 The granite pavement carpet by acclaimed Minnesota artist George Morrison was originally sited in 1992 at the entrance to the IDS Center where it could be viewed overhead, from the skyway, and up-close while walking on Nicollet. This location, access point for emergency vehicles including heavy fire trucks, challenged the survival of the mosaic. Weight loads combined with winter freeze-thaw conditions caused some of the two-inch thick granite pieces to crack. Salt applied in winter deteriorated the mortar and destroyed the setting bed, loosening the pavers. Several patch jobs began to detract from the mosaic’s appearance. In 2004, the mosaic was restored and its next location was adjacent to Minneapolis Central Library and a grove of birch trees along the east side of the building. Thought to be a safer place away from heavy vehicular traffic and with only foot traffic, cracking and mortar failure continued to be a problem. Second location was Minneapolis Central Library, 2004-2016. Photo: Jerry Mathiason. The design team for Nicollet led by James Corner Field Operations considered several new locations and settled upon the connection with the Loring Greenway between 11th and 12th Streets. This lush landscaped setting would complement the woodland imagery in the mosaic. Tableau would become the centerpiece of an ensemble of curving wood seating walls and planting beds and for the first time, instead of just walking over the mosaic, people could actually take a seat and examine it close-up. Technical problems had to be solved before the mosaic could be re-installed. 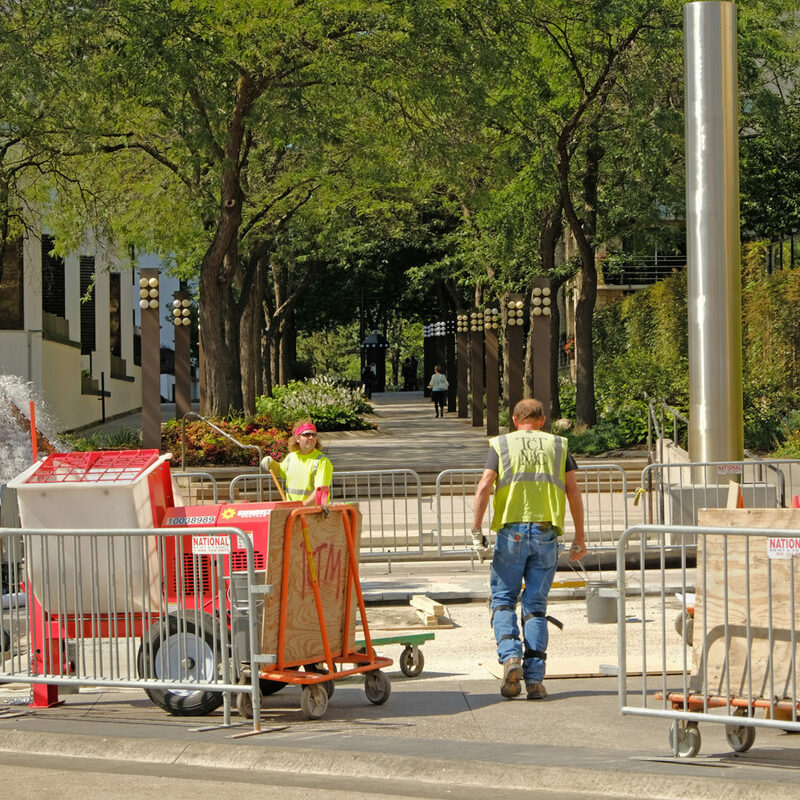 After it was removed from Nicollet in 2016, SEH, INC who has worked with the City as Construction Manager throughout the recent public art installations, produced several mock-ups to field test different methods for setting the granite. 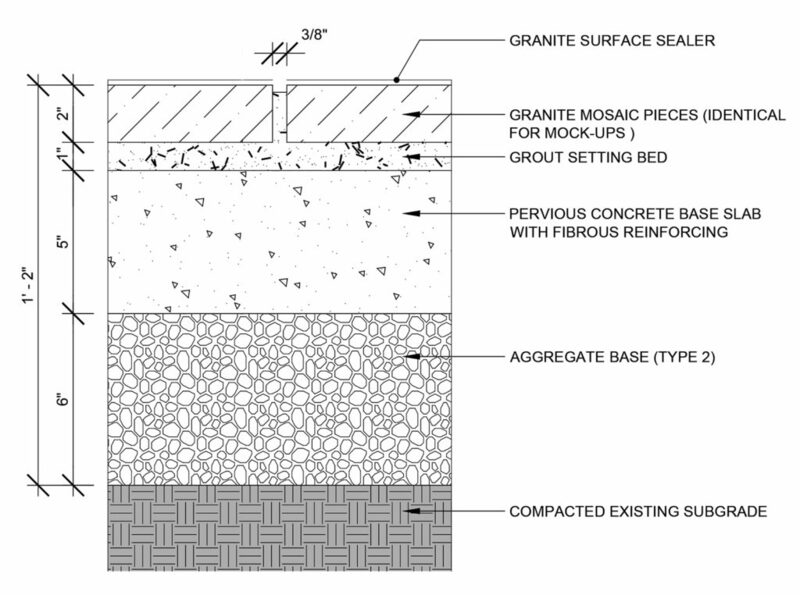 Bob Kost, ASLA, Public Art Collections Manager with SEH, INC says the entire technical cross-section composed of pervious concrete, mortar and grout mixtures, and sealant, was field-tested over a two-year period. The mockups were evaluated prior to developing the final drawings and specifications for the re-installation. Granite paver setting cross-section courtesy SEH, INC.
A pervious concrete base and a modified granular mortar mix for the grout setting bed were selected because they would move water away from underneath the granite pieces; especially important during the freeze-thaw season. Challenges continued when Yerigan Construction started to prepare the site to install the work in late August. 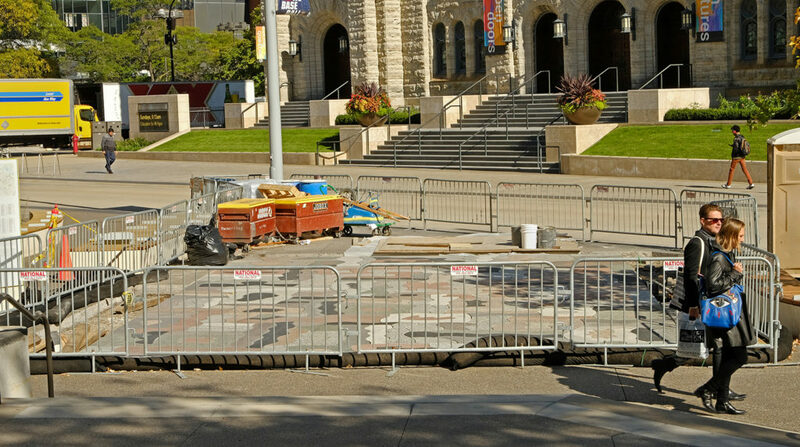 Removing the sidewalk to inset the mosaic, they discovered that not only did it slope eastward to Nicollet but also slightly to the south – the site was a compound grade, sloping in two directions. Imagine setting over 200 pieces of granite of different shapes, with no more than 1/4” difference in height between pieces in order to meet Americans with Disabilities standards, across a warped plane! Fortunately, the modified granular mortar mix will be flexible enough to accommodate these variations. Twin Cities Tile and Marble Company, a sub to Yerigan Construction, are particularly skilled in setting Morrison’s mosaic. Master mason Mike Schermerhorn leads the team that includes Henry Kisumu, Jake Nelson, Adam Pettit, Rob Williams and Steve Violet. Mike says that this is the fourth time that they have de-installed or re-installed the artwork! Also on-site daily during re-installation is Kristen Gillette, conservator with Kristin Cheronis, Inc. who restored the granite mosaic. The installation commenced after the Labor Day weekend. Over the course of the following weeks, I paid several visits to the site and produced a photo essay documenting the re-installation.